As you know, Google is continuously introducing and improving their algorithms to keep their search results spam free and most importantly, to provide users with most appropriate information that they are looking for and thus improve user experience. In order to ensure enhanced user experience, Google has introduced several major algorithm updates including Caffeine, Panda and Penguin updates in last couple of years. In continuation to their effort of improving user experience, Google has recently launched a huge algorithm update called “Hummingbird” in last August. All these efforts, taken by Google, make it very much clear that this search engine giant is introducing all these sorts of updates only to keep users happy with their search results through serving the most suitable results to them. In continuation to this effort, Google has added a new feature namely “Manual Actions” in last August 18, 2013 under the “Search Traffic” section of Google Webmaster Tools allowing verified site owners to check whether their site has been manually penalized by Google. Manual action refers to penalties imposed against websites only after reviewing by real humans from Google web spam team and finding those sites violating Google’s Webmaster Guidelines. Under this manual spam action, sites may be penalized either wholly or partially based on severity of web spam. The end result of this manual action is decreased organic traffic through de-ranking or even removing websites from search results. Though Google has most advanced and strong enough algorithms to find out and penalize most of spammy search results, but they are also implementing manual actions such as de-ranking or even removing websites from search engines for practising spammy techniques. 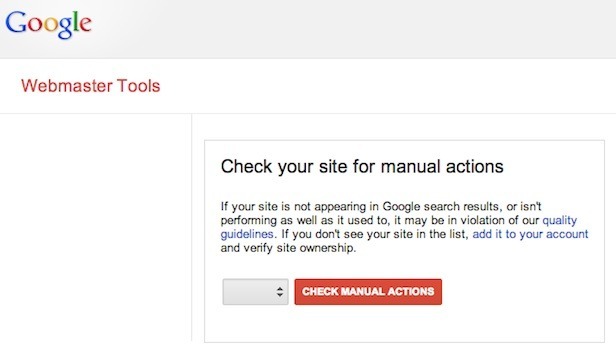 If your site isn’t appearing in search results or loosing organic traffic drastically, then you must at first check your “Manual Action” page from Google Webmaster Tools to make sure whether the site violated Webmaster Guidelines. This “Manual Action” page has the following 2 separate sections describing the severity along with the reasons and effects of those web spams. Site-Wide Matches: Messages will be displayed under this section, if your committed web spam affects the entire website. Partial Matches: This section lists actions that affect only particular URLs or portion of a website. Getting messages under this section is quiet common, particularly for sites having forums, guest book pages or user profiles. Google is currently imposing manual actions on websites practising any of the following web spam practices. Are you acquainted with all these spammy techniques? If not, then I will try to give you a little more insights into all these webspams here. The following section will help you understand what these web spam techniques are and how to recover your ranking position if you have been already penalized for practising such spammy techniques. Cloaking simply means showing different pages to the human visitors than are shown to search engine bots. Suppose, if you show a webpage of images to human visitors while showing a page of HTML text to search engine bots, it would be considered as cloaking. Besides, if you willingly make some crucial directories of your site inaccessible to search engines where human visitors can easily access, it would also fall under this web spam category. Google’s Webmaster Guidelines strictly restrict this harmful practise. If such practice, Google may apply manual spam actions against some particular pages or against your entire website. If Google’s manual actions affect your entire website, you will get message under the Site-Wide Matches of Google Webmaster Tools (GMT). And actions that affect only some portion or pages of your website or some incoming links, you will get message under the Partial Matches section of GMT. First of all, find the problems associated with the particular portion or pages of your website that has been mentioned in the message. You should use the Fetch as Google feature of GMT with which you can see how Google is seeing your particular webpages. Then compare the two contents i.e. content that fetched by Google and the content than human visitors see to make sure whether there is any difference or not. If two contents differ, that is cloaking really exists, then you need to identify and remove that portion of your website that is serving different content to users and bots. To do so, you may require looking through your site’s code from the server. Carefully look for URLS throughout your website which conditionally redirect such as only redirecting users who are coming from certain locations or only redirecting users who are coming from Google SERPs. If your site is using any of above two redirections, it’s high time you find out and remove those portions of website where such redirections are being used. To do so, you may require changing your site’s code from the server. Once you are confident that your site isn’t using any such redirection to do cloaking, submit a reconsideration request to Google webspam team specifically describing what you have done to solve the problem and also promise that you will never use such bad practices in future. Once Google is satisfied that your site no longer violates Google’s quality guidelines, they will revoke the manual action imposed on your site. If Google assume that some of your pages or your entire website has been hacked by any third party, then you will get manual penalty under this category. Often hackers upload or modify crucial files of a website for which Google often treat such site as website having spammy contents. In such situation, Google often label such website as compromised to keep visitors away from such spammy sites. First of all, try to find out how and why your site has been hacked. This will help you determine how to get back your site in its previous state and also help you keep your site protect from being hacked in future. Google is offering some exclusive video tutorials with which you can find out why and how your site was hacked. Keep in mind that the time of your site recovery fully depends on the extent of damages hackers made on your site and the technical skills of yours. Companies like BlueHost offer malware protection service. If your site is compromized, then contact your hosting company informing them that your site has been compromised and requesting them to help recover your site. In most the cases, hosting companies successfully solve such problems. If your hosting company fails to solve, then try to get recovery assistance from various reputable online communities and discussion forums or otherwise think about transferring your entire site to another hosting company who specializes in recovering websites. Once you have chosen your recovery process, it’s time to take your site offline so that hackers no longer able to cause harm to your site or to your visitors. This will enable you perform the recovery process without interference from hackers and malicious codes or spammy files won’t be accessible by visitors. As soon as you have quarantine your site in the above step, login to your Google Webmaster Tools and check out whether there is any critical message from Google. Also make sure whether there are any unauthorized users or owners in your WMT. You should also analyze Security Issues section of WMT to ensure whether there is any malware or phishing notification. Now you have an overview of your entire site from GMT, try to assess the damages made by hackers. Make a list of all the affected files, whether they are infected with malware or spam, and try to determine hackers’ intent. In this step, as you now have the list of spammy and malware contents along with your site’s vulnerability, so clean all those harmful contents keeping only good contents, solve your site’s vulnerability issues. When you have done all these tasks properly, bring your site back online. Finally submit a reconsideration request to Google. Google will revoke the manual penalty only if they don’t find any harmful or malicious contents while reviewing the site. Hidden text refers to those hidden texts or links within a content which are used to manipulate search results. For example, if you use white text/link on a white background or set your font size 0 in your webpage, such practices would be considered as having hidden text which is a violation to Google’s Webmaster Guidelines. On the other hand, keyword stuffing is the practice of loading a webpage with targeted keywords without adding any substantial value to the content in order to manipulate search results. For example, repeating targeted keywords again and again throughout a content which looks unnatural. If Google finds that you are practising any or both of these bad techniques to manipulate search results, you will get message under the Manual Action page of WMT. In both cases, Google may apply manual actions either on your entire site or some pages of your site depending on the severity of your web spam. Use the Fetch as Google feature from the GWT to check those affected pages or site to find out what’s visible to search engine bots but aren’t visible to human users while browsing the site. Examine texts that are of same or similar colour as the background of the webpage. If any, re-style or remove those texts so that texts can be equally discoverable by human users and also by search engine crawlers. Check whether there is any list or paragraph with repeated words without any context. Also examine title tags and alt text for strings of repeated words. Once you are sure that your site no longer has any hidden text or keyword stuffed content, request Google to reconsider your site. If Google satisfy with your site while reviewing the site for not breaching any quality guidelines, they will definitely revoke such manual penalty from your site . If you get this message in your WMT account, then it’s because Google has detected that your site is aggressively practising bad techniques like cloaking, copying content from other websites or auto-generated gibberish etc. that are strictly against Google’s quality guidelines. For such pure spam, Google may apply manual spam actions to specific portion of a website or to the entire site. Actions that affect some pages of website are listed under Partial-Matches section of GWT and actions that affect an entire website are listed under the Site-wide Matches of Google Webmaster Tools(GWT). After reviewing the request, as soon as Google spam team satisfies that your website isn’t violating their quality guidelines, they will repeal the manual spam action from the website. If you run a free web hosting service and a significant fraction of webpages hosted on your service are spammy, Google may take manual action on your service as a whole for such spammy freehosts. Implement actions to identify and prevent spammy actions on your service such as telling users not to make spams, restricting automated account creation, identifying spammy accounts etc. Once you’re sure that your service doesn’t breach any of Google’s quality guidelines, request Google to review your site. If Google spam team finds your site not violating any quality guidelines, they will abrogate the manual penalty. Carefully examine whether the website includes any contents copied from any other websites. If the website contains any of these 4 types of contents, then it’s crucial to determine whether those contents provide significant added value for the users. Improve the entire website through enhancing contents to provide significant added value to the users. Once the website owner is sure that his site no longer has any thin or low quality contents, he will request Google to review the site. If Google spam team finds the site not violating any quality guidelines, they will revoke the manual penalty. If you are selling links excessively or sharing your Page Rank with others just to manipulate their rankings in search results, you will definitely be penalized for such spammy activity. For such offence, Google may apply manual actions either on your entire website (Site-wide Matches) or on some spammy portion of your website (Partial Matches). If your site has been imposed manual action for such spammy activity, first of all identify all those links that were paid or that appears to breach Google’s quality guidelines. For example- excessive outbound links from a single page. Remove those unnatural links from your site or make those “Dofollow” links as “Nofollow” so that those links can’t pass PageRank. Once you are satisfied that you no longer have any such paid links or unnatural do-follow links on your site, submit your reconsideration request to Google. If Google thinks that your site no longer violate any of their quality guidelines, Google will definitely abrogate the manual penalty. If you have excessive low quality or unnatural or manipulative links pointing to your site, Google may impose manual action for such web spam. Google may also apply manual actions if they think that you have bought links or participated in link schemes to manipulate your PageRank or search engine rankings. In both cases, Google will impose manual penalty either against your entire website or against some particular pages. Actions that affect the entire website are listed under Site-wide Matches and actions that affect some specific portion of website are listed under the Partial matches if GWT. Carefully examine the list to find out which sites or backlinks are in violation to Google’s quality guidelines. If your site has plenty of backlinks, then a simple trick to find out spammy links is look through links that were made last couple of months or look through sites’ list to find out from which sites you got excessive backlinks. After identifying those spammy links or websites, your job is to contact webmasters of those sites requesting them to either remove your links from their sites or add rel=nofollow attribute to those links so that they no longer able to pass PageRank. Use the Disavow Links tool from GWT to disavow those links or domains whose Webmasters didn’t respond to your request. Once you are satisfied that you’ve disavowed or remove all unnatural, artificial backlinks, submit a reconsideration request to Google. That reconsideration request must have as much detail as possible including what links you have disavowed and explanations of why you fail to remove some links etc. After reviewing your request, if Google spam team be sure that your site no longer has any artificial or paid links, they will revoke the manual penalty. If those spammy backlinks are outsite of your control, you won’t require to do anything. Google will automatically ignore counting those links while ranking your site. Try, if possible, to remove those artificial backlinks by yourself and if you succeed to do so, make a reconsideration request to Google. If Google finds that your site no longer violates their quality guidelines, they will abolish the manual penalty. If you are penalized for such web spam, at first try to identify areas where users can add content on your site. Such areas might be user profiles, blog comments or forums etc. Carefully examine whether your site has any profiles or posts with off-topic links. Check your entire website to find out whether there are any profiles or posts that looks like advertisement. Check throughout your website to find out whether there are any profiles or posts that appear to be automatically generated. Examine whether there are any profiles or posts with commercial names like “Health Insurance”, “Car Loans” etc. which usually don’t belong to real humans. Remove all contents that are related to any of the above four types. Implement some prevention techniques such as using “nofollow” tags, comment moderation, anti-spamming tools etc to prevent your site from further user-generated spam. Once you are confident that your site no longer has any user generated web spam, request Google to reconsider your site. If Google satisfy with your site while reviewing the site for not breaching any quality guidelines, they will definitely revoke such manual penalty. This is the most recent webspam that Google just included in this November to their manual action spam list. If your site’s images appear differently in the search engine result pages that what visitors actually see while visiting the site, Google may impose manual penalty on your website for such image mismatch. If manual action is applied only for certain web pages, message will be sent under Partial-Matches section of GMT and if action is applied against entire website, then message will be stored under Site-wide Matches section. In both cases, penalty must be removed for better ranking in search engines. If you are penalized for such image mismatch, make sure that your site displays exactly the same images to the visitors whether the site is viewed directly or from Google Image Search Results. Anti-hotlinking tools sometimes result in this kind of image mismatch. If so, you will require examining your site’s code from the server. Once you are satisfied that your site’s images are exactly the same whether they are viewed directly on your site or from Google search result, request Google to review your site. After submitting your request, wait for some days until receiving message in your GMT account. If Google spam team satisfies that your website is no longer in violation of their quality guidelines, they will abrogate the manual penalty from your site. Hope, this post will definitely help you better understand Google’s manual penalty and ways to recover from such manual penalty very effectively. If you would like to add something new, please share with me. Thank you. I saw that many site did not recover from this penalty after revoke.